A fragrant and spicy mixture of rice and goat meat slow cooked in a vessel sealed with dough. 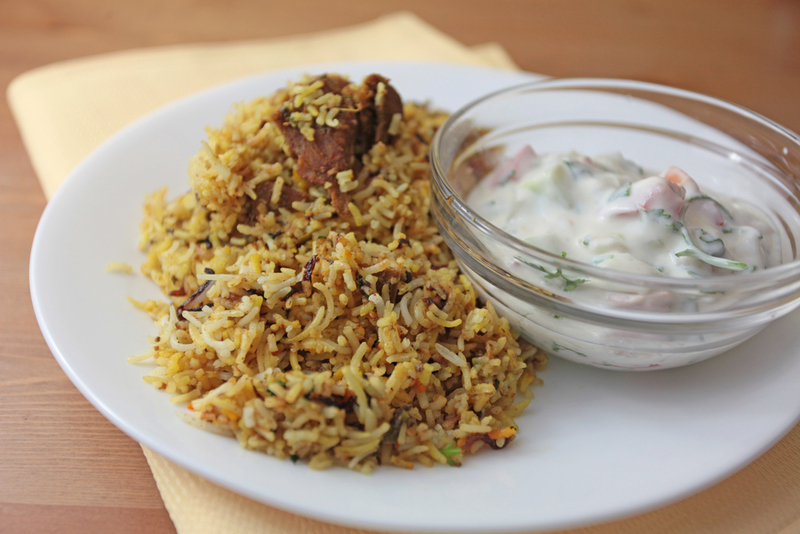 Cooking biryani is no easy task, especially dum biryani which calls for the meat and rice being prepared separately and then combining it together to bake in it's own steam. It is time consuming and involves some complex steps that can surely leave you intimidated. To make things easier I'm going to divide the process into 4 parts - Preparing home-made biryani masala and marinating the meat, prepping the rice, caramelizing the onions, and finally putting everything together to make the biryani. 1. Grind the biryani masala spices into a fine powder. Keep aside. 2. Marinate the mutton. Add salt, ginger garlic paste, chilies, biryani masala, turmeric, red chili powder, yogurt, half a cup of cilantro and mint leaves, and mix well. Let it marinate for minimum 2 hrs (for best results marinate overnight). 3. 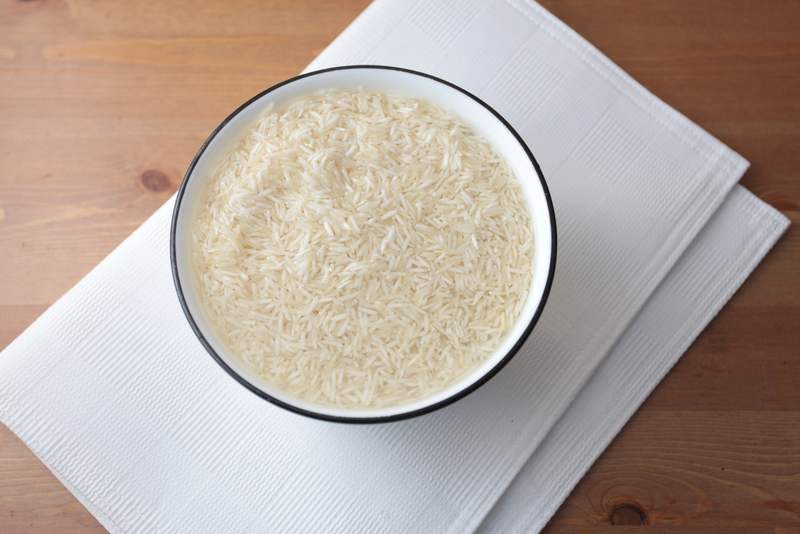 To prepare the rice, firstly rinse it at least 5-6 times, then soak it in a cup of water for 15-20mins (water should rise a couple of inches above the rice). 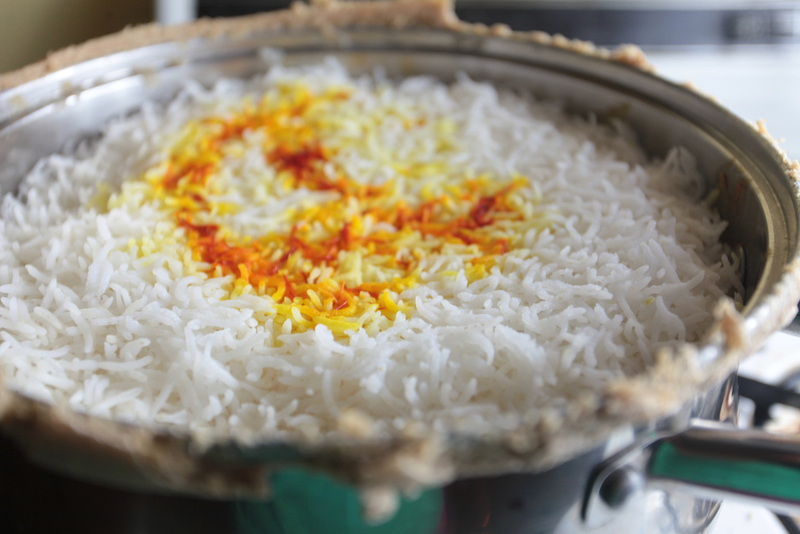 Once the rice absorbs the water on the surface it is ready to be cooked. 4. Fill a pot with water, add salt and bring it to a boil on a high flame. When the water starts boiling intensely, add the rice, and lower the heat to a medium flame. 5. Cook the rice for approximately 15 minutes or until it begins to float on the surface. 6. Make sure that the rice is al dente, which means that it should be undercooked. 7. Strain the excess water and set it aside. 8. To caramelize the onions, add a cup of oil in wok and heat it on a high flame. Once the oil starts bubbling add the onions and fry it till it turns golden brown. 9. Place the caramelized onions on a paper towel to drain the excess oil. 10. Lastly, soak saffron strands in milk and set aside for at least 15mins. 12. Finally, it's time to cook the biryani. Heat ghee/unsalted butter in a large vessel, over a medium flame. Turn the heat down to a low flame. First, add the marinated mutton (make sure it's at room temperature before cooking) and mix it with the ghee, then add a layer of caramelized onions over it, then add the rice. 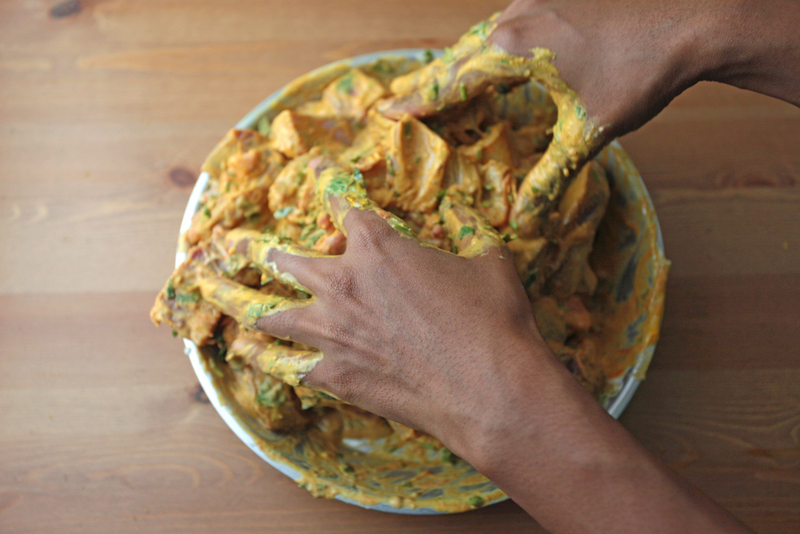 Top it off with the saffron soaked milk. 13. Cover with a lid and seal it with the dough. Add a pan filled with water over this, and let the biryani cook on a low flame for at least 45-60 minutes. For best results slow cook the meat for an hour and a half. 14. 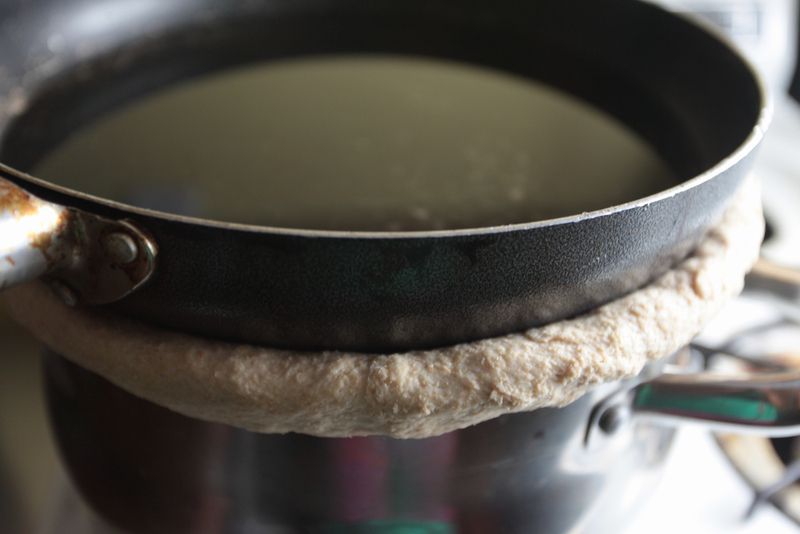 When the biryani is ready, take the pan off the vessel and break off the dough. 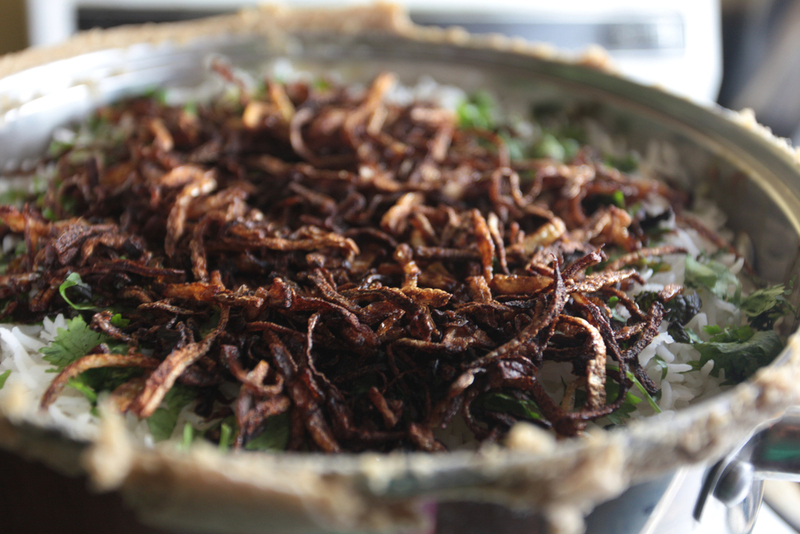 Open the lid and garnish with the remaining caramelized onions, and coriander and mint leaves. 15. Mix well and serve with raita (yogurt mixed with tomato, onions, cucumber, cilantro and a pinch of salt). Make sure to get fresh mutton, specifically mutton which is still on the bone (shoulder meat). Rinse the mutton 8-10 times and dry it. 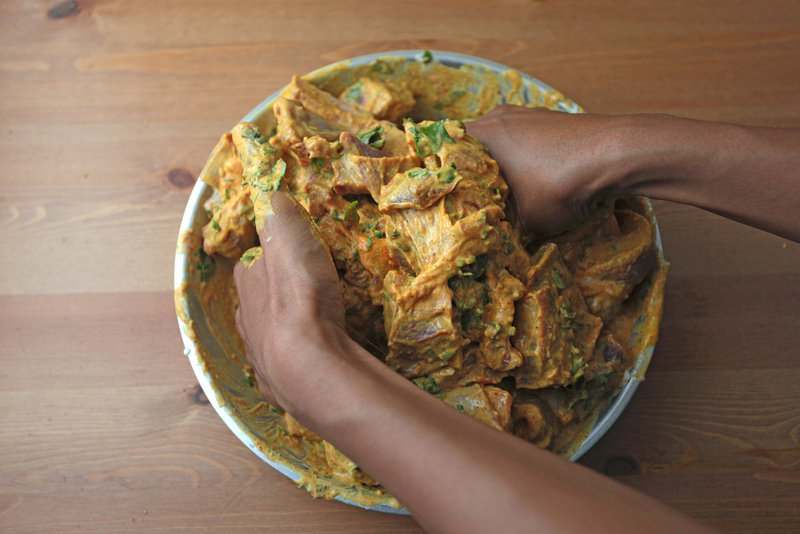 Before marinating, you can also use a tenderizer like raw papaya paste on the meat. To add some extra flavor to the rice, add about 4 black peppercorns, 4 cloves, 2 bay leaves, 1 tsp cumin seeds, and ghee to the rice when it's being cooked. Slow cooking the meat ensures that it remains tender. If you have the time, slow cook the meat for an hour and a half for best results. You can also garnish the biryani with some nuts and dry fruits like chopped almonds and cashew nuts, raisins, etc to enhance the overall flavor of the biryani.